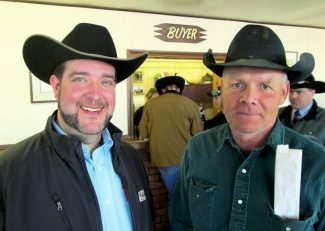 Jay Watje with Harold Miller, Mud Butte, S.D. Watje Zimmerman presented another good set of Charolais bulls at Faith Livestock Commission Co. Although their numbers were relatively light this year, they still brought an outstanding set of bulls for quality. These bulls were big and long, and chocked full of muscle. Jay Watje raises these bulls at Willmar, Minn., and brings them out to western South Dakota for area ranchers. This was their 18th annual production sale, and they just keep improving. The demand has been high for Charolais bulls in South Dakota this spring, and this was a great place to select those Charolais genetics to produce those heavy weaning Charolais cross calves. Many repeat buyers were on hand to compete for these good bulls. Most of the bulls were yearlings with a lot of performance, and they weighed in heavy. This firm uses the herd sires of Diablo, Backdraft, Firewater, Turton, and Game On. Their cow herd is based on Riggins X Easy Breaker genetics. Top selling bull of the day was shared by two bulls, with each selling for $7,500. Lot 2 sold for $7,500 to Bobby Collins, Faith, S.D. He was sired by TR PZC Mr Turton and out of a daughter of JDJ Smokester. His EPDs were CE 1.0, BW 1.4, WW 34, YW 58, MILK 16, MCE 1.4, and MTL 33. Born at 89 pounds, he weaned at 848 pounds. Stanley and Kenny Matt, Union Center, S.D., paid $7,500 for Lot 3. Here was a son of TR Mr Fire Water 5792 RET, who was out of a daughter of JDJ Smokester. With a birth weight of 87 pounds, he weaned at 897 pounds. Completing his stats were EPDs of BW 2.4, WW 34, YW 57, MILK 23, and MTL 40. Lot 16, a picture bull, sold for $6,500 to Ron Goldade, Timber Lake, S.D. This son of CML Diablo 2X was out of a daughter of Easy Breaker and was 93 pounds at birth. He weaned at a great weight – 963 pounds. Fairview Ranch, Faith, S.D., were repeat buyers. They chose Lot 22 at $6,500. He was a son of CML Diablo 2X, and out of a daughter of LT Western Spur 2061. With an 82 pound birth weight, he had weaned at 815 pounds. Jason Reed purchased Lot 4 at $6,000. He was by TR Mr Fire Water with a birth weight of 91 pounds and a weaning weight of 910 pounds. We will be anxious to see the good bulls they bring out to Faith for next year's sale. Call up Jay Watje and visit about your needs. He will be happy to visit with you.